I woke up this morning feeling like I had aged 50 years overnight. All the muscles in my upper body were sore, my elbows and knees raw and bruised, and my ankle puffy and throbbing. After the adventure we had yesterday, I might have to take a few days off from hiking. We spent a leisurely morning relaxing around the house before packing up and heading down the road to Bryce Canyon. 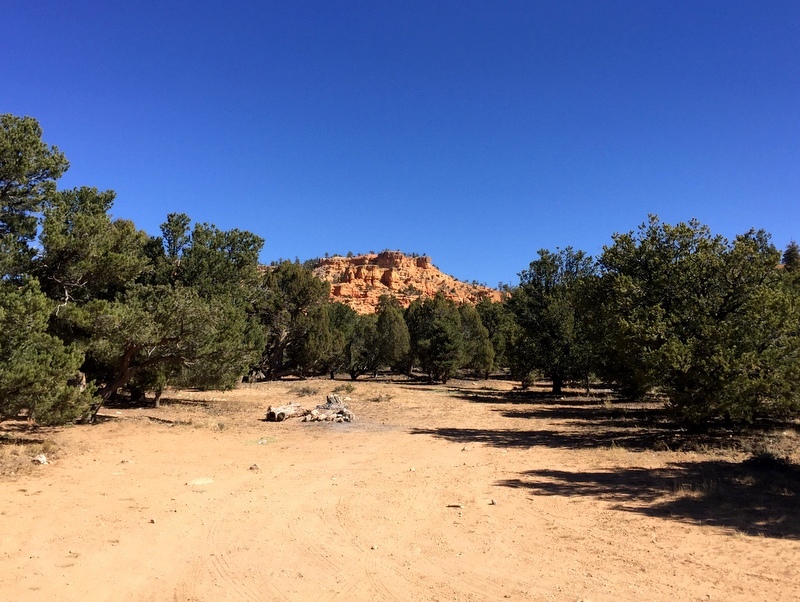 Last time we visited, in the early spring of 2016, we stayed at the North campground inside the park in an effort to be close to the canyon and hiking trails. It was okay. The sites are fairly close together and typical of what you find inside a national park. The most enjoyable part was that the canyon rim was only a short walk from our site. 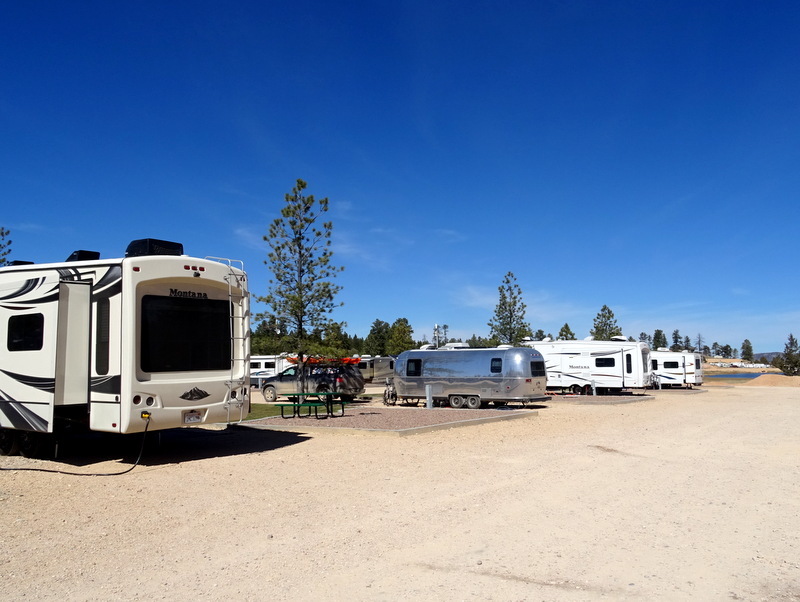 This time, we made the decision to go for full hook-ups at an RV park. Partly because with nighttime lows forecasted in the 20s it’s nice to have electric hookups so we can supplement the furnace with our little electric space heater, and partly because it’s my birthday week and I want to be able to to take as many long hot showers as I want! Funny how that’s now what I consider luxury. We booked a spot at Ruby’s RV Park. 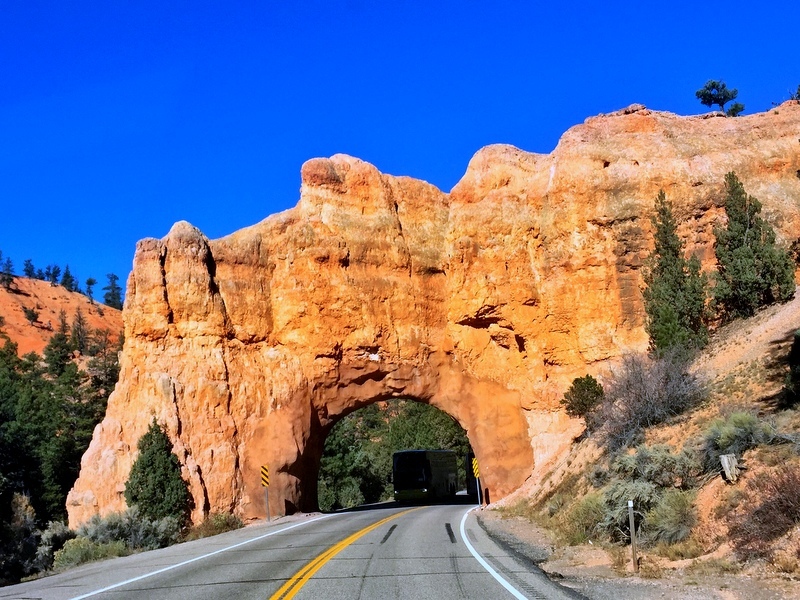 With their name on the local motel, general store, gas station, diner, RV park, and more, Rubys pretty much owns the town of Bryce Canyon. I reserved a basic full hookup spot but somehow when we arrived they gave us a big rig pull thru. The price was the same but the site so much nicer. We only paid $34 per night because we stayed more than five nights. That’s not bad considering the campground in the park is $30/night for no hook-ups. The basic full hook-ups sites are squished together in a haphazard arrangement under a heavily treed area. I’m sure in the summer months the trees are nice, but it doesn’t make up for how ridiculously close together they are. On the other hand, the big rig area is basically a giant dirt lot with the sites laid out in a grid pattern. 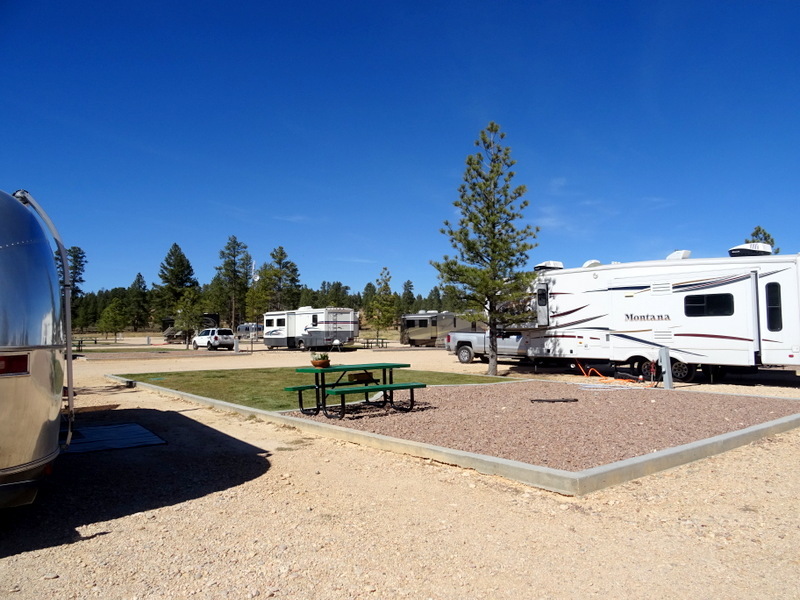 Not only are the sites themselves very wide, but between each site is a large area of grass and gravel with a picnic table and fire pit. 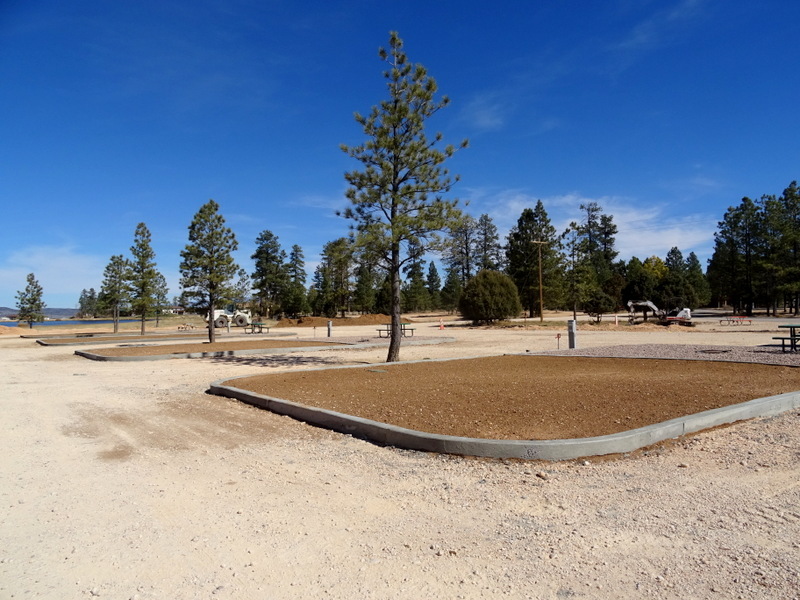 I have never, ever seen an RV park with this much space between sites. It looks like the remaining sites in the area are in process of being upgraded. The row behind us had new looking cement curbs and no grass, while the row behind that was actively getting new curbs during our stay. While it’s not a pretty or scenic park, the fact that we didn’t have neighbors five feet from us on either side was a welcome change from most private parks. Even though we arrived around mid-afternoon, we didn’t bother to go into the national park. Instead, we took a short walk over to the general store for cheese and salsa (the pantry and fridge are both looking very sad) and then stopped to visit our friend Jeff on the way home. We chatted with him for a bit and made plans to meet up for breakfast the next day before heading home to prepare for a very cold night. When I woke up this morning it was only 16 degrees! Thankfully, we had filled our water tank and unhooked the hose last night. During check in yesterday, they told us that 10 people called that morning to ask if the park had shut off the water. I guess they didn’t realize that their hoses had frozen. Tim was able to shift some work things around so we could meet Jeff and his wife Coffee for breakfast. Our planned meeting time was 8 am and by then the temps had only risen into the low 20s. For the first time since we left Vermont five years ago, I used the automatic starter to warm up the truck before we went outside. Almost forgot I had that thing on my keychain. Bryce Canyon is not known for its stellar culinary cuisine. 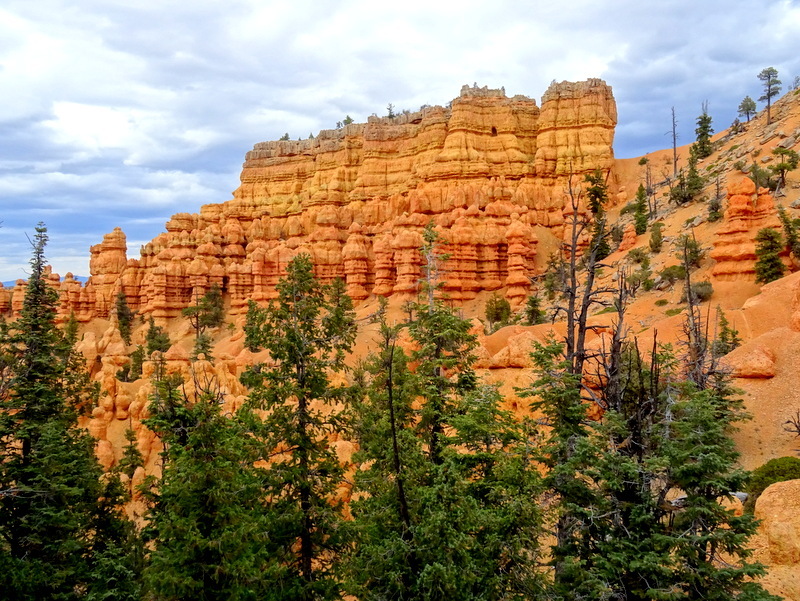 Unlike Torrey and Escalante where you can at least find one or two decent places to eat, Bryce has nothing good to offer. Kind of strange when you consider how many people travel through the area. Even Jeff and Coffee who have been working here all summer didn’t have any good recommendations. 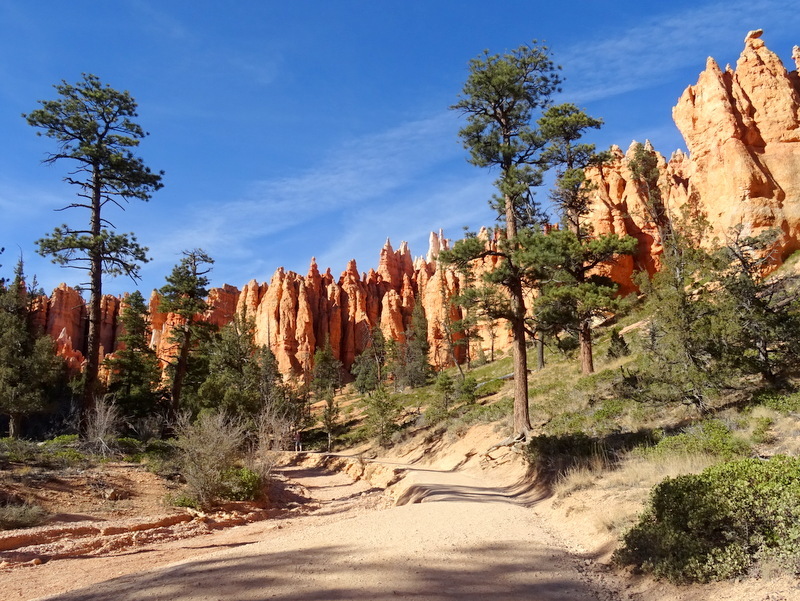 We ended up at Bryce Canyon Pines which gets better reviews than any other place in town. I can’t comment on lunch or dinner but the breakfast was pretty good. They get points off for not having real maple syrup, but I’ve come to realize that sadly most of the country is okay with the fake corn syrup stuff. Not me, not ever! We met J & C about a year and a half ago when we stopped in Escalante for the first time. They also live full time in an Airstream and generally spend a few months in one area working various jobs. Tim & Jeff had corresponded on the Airforums and when they found out we were coming to Escalante they generously shared a fantastic boondocking spot outside of town with us. We had fun getting to know them that week and it was so great to see them again. I wish I had remembered to take a photo of the four of us, but we were so busy chatting that I totally forgot. After breakfast, Tim went back to work and I took a drive to the grocery store. 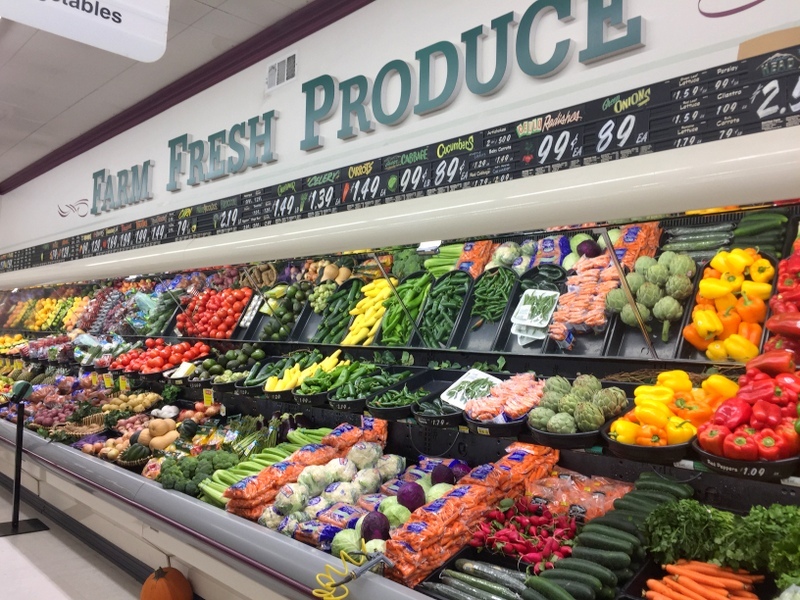 It’s been almost a month since we came across a decent grocery store and despite all the stocking up I did in Park City, we were low on a lot of things. The local grocery store in nearby Panguitch is about the best you’re going to find around here. It’s only a half hour drive and a huge improvement over the general store in Bryce (which isn’t saying much). I found most of what I had on my list but had to make few last minute changes to the menu for the week. On the way home, I took a quick detour to check out some potential boondocking spots for next week. The best one I found was only two miles from the main road. It was very dusty, but scenic and private with a good cell signal and an awesome view. Looks like a good possibility. Tim worked a little later than normal to make up for the hours missed this morning, but we still had enough time for a short bike ride into the park. 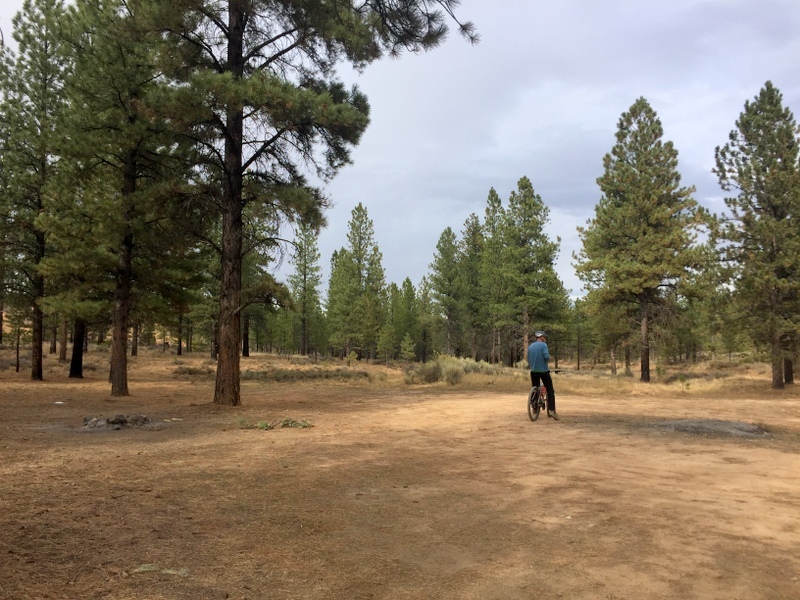 The paved bike path that travels through Red Canyon and into the national park was easy to access right across the street from the RV park. 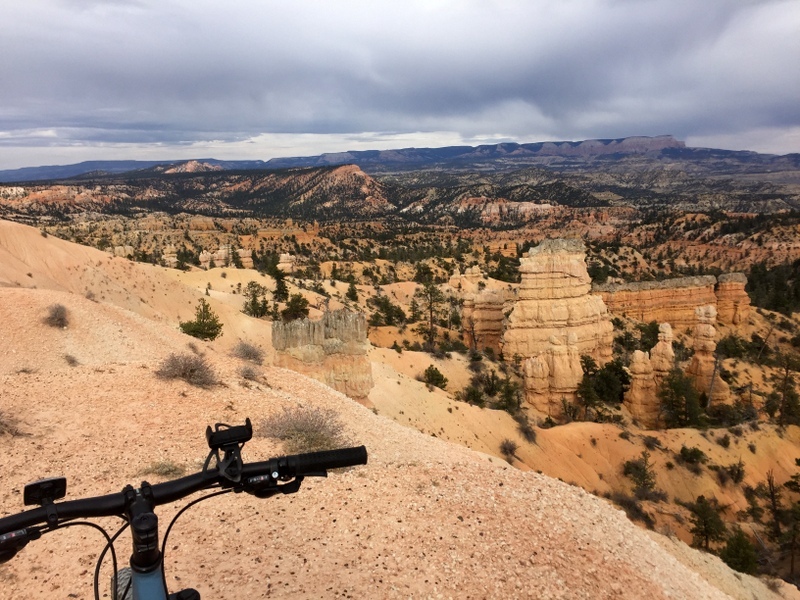 It was a three-mile ride to the rim of the canyon. The path is very nice, but riding into the park was uphill the entire way. While the slope was fairly gradual, up here at 8,000 feet we were feeling the lack of oxygen. A quick downhill ride back to the Airstream got us home just before the sun sank and the cold settled over us. The biking didn’t bother my bruised ankle at all, which means tomorrow we can do some hiking. 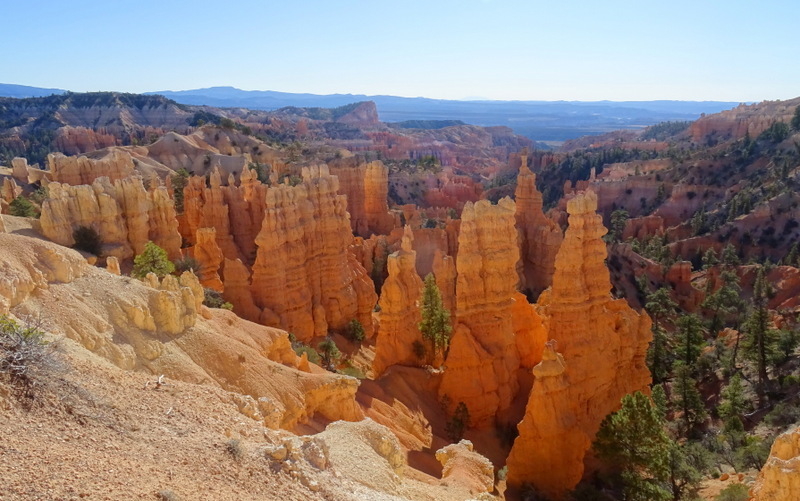 Compared to some other national parks, Bryce Canyon doesn’t have a lot of hiking trails. Due to the nature of the park, you’re basically limited to hiking down into the canyon and then back up. There are a couple of short to medium length trails that wind along the bottom of the canyon, and one longer trail that makes a loop through some stunning rock sculptures. Last time, we hiked all of them except the longer eight-mile Fairytale Loop. There might not be a large number of trails in the park, but they are ALL stunning! 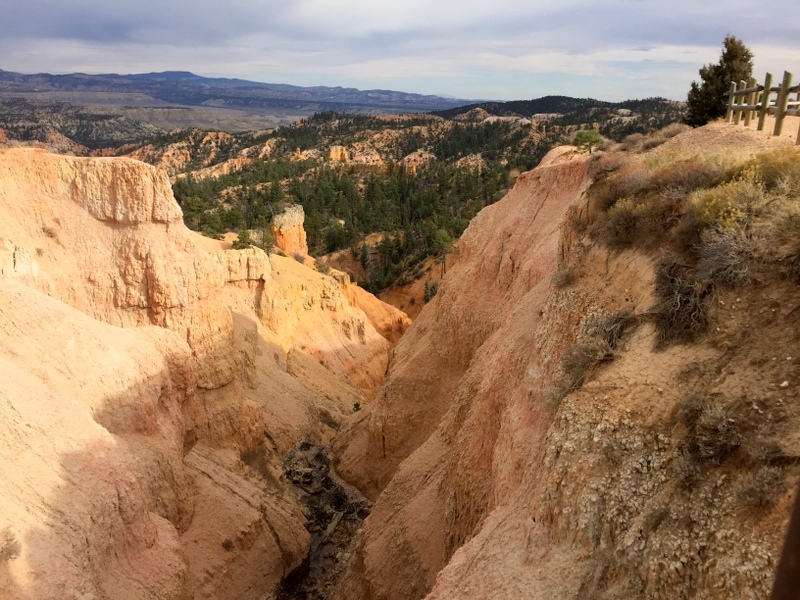 But just like during our return visit to Capitol Reef we have no qualms about re-hiking some of these trails again. 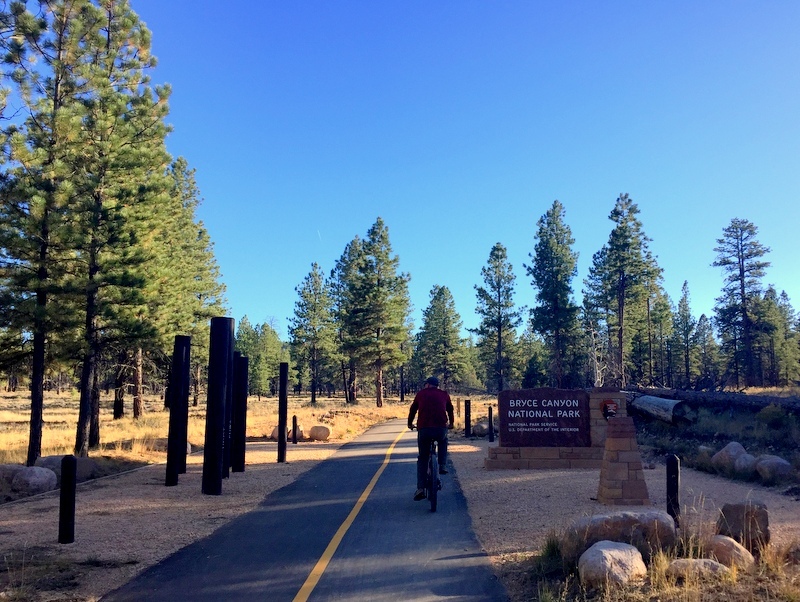 The most popular, and shortest, trail in the park is the Queen’s Garden Loop. 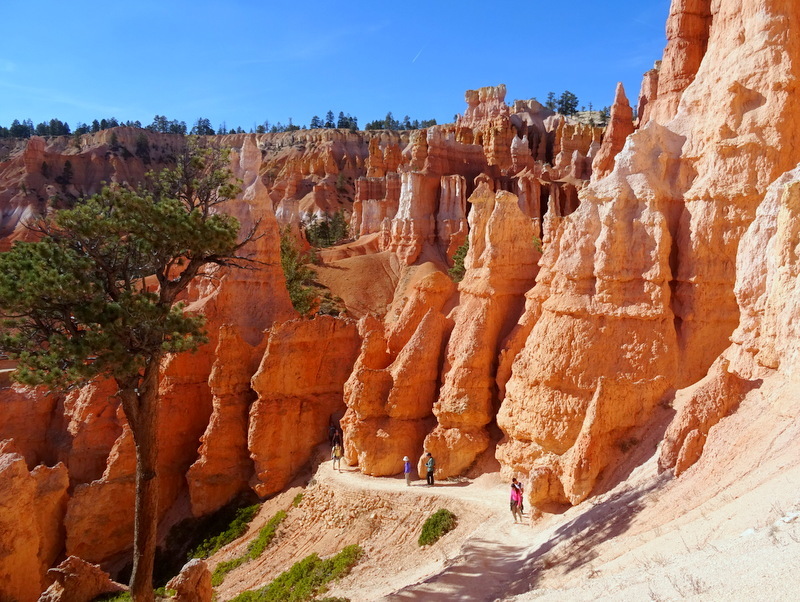 It travels down into the canyon and through an area dense with tall hoodoos, spires, windows and even a few man-made tunnels. 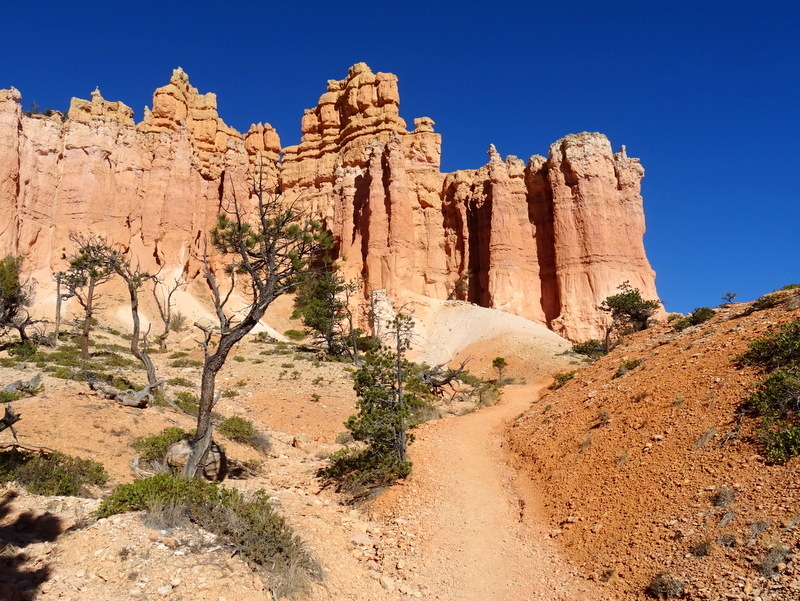 An easy way to extend the hike is to combine the Queen’s Garden loop with the Navajo Loop. You can either hike them as a figure eight or go down one trail and up the other. That’s what we did by going down Queen’s Garden and back up Navajo. During our last visit, it snowed a few days after we arrived leaving the trails soggy and slippery. As a result, they closed one side of the Navajo Loop. This time it was open and dry so we climbed back up the canyon on the Wall Street section. So cool! Some clouds rolled in this morning and by late afternoon it was nearly all cloudy. Instead of another hike in the park, we hopped on our bikes and rode over to the Tropic Ditch overlook. The story goes that over a century ago, Mormon pioneers carved out this ditch to divert water from the Sevier River. It took them three years using hard labor assisted by primitive tools. This ditch/canal/waterway is over 10 miles long and brought life-sustaining water to the area and helped establish the towns of Tropic and Cannoville. There is a trail that follows the ditch called the Mossy Cave Trail, but it wasn’t on our radar today. Leaving the ditch behind, we followed a pockmarked horse trail along the rim for a bit before turning onto a dirt FS road. After crossing the main road we made a wide loop on the maze of roads that wind through the pine forest and then back to Ruby’s. The area we rode through it not inside the park boundary and as a result, offers a number of great boondocking options. This was where we wanted to stay last time but it was too wet and muddy. When I was 20, people who were 40 seemed really old. Now that I’m 40, people who are 60 don’t seem old at all. Is that because I now think like an old person??? I’ve never been bothered by getting older. I have never said things like “I’m turning 21 for the 10th time” or refuse to tell people my exact age. 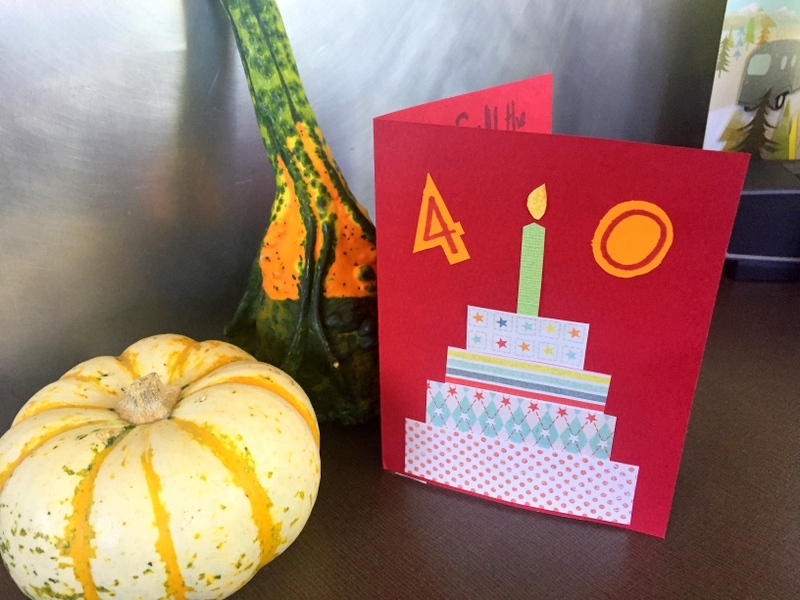 But for some reason over the past few weeks, I’ve had some mixed feelings about this whole turning 40 thing. It feels more significant than any other birthday. Like I’m entering a new phase of life that I’m not sure I’m ready for. But as I’ve thought about it more I realized that I’ve been looking at it all wrong. Instead of feeling like I’ve crossed some threshold that will usher me into a sedentary life of cat petting and bingo playing (not that there’s anything wrong with either of those things) I need to be focusing on how getting older can change my life for the better.My new outlook is that if you spend the years before the age of 40 going through the painful process of figuring out who you are then it stands to reason that after 40, you spend the rest of your life trying to become the best version of that person. I think I’m ready to try for that best version. Finally, I have been saying all summer that I wanted to do something epic and badass for my birthday. Something that takes the number 40 and stomps on it. Well…I think that crazy hike/climb through the Red Breaks slots that we did last weekend counts as both epic and badass. The day started off dreary and rainy, but when it cleared up in the afternoon we decided to drive over to Red Canyon for a short hike. On the way out we stopped at the office to pick up our mail and some packages we had ordered from Amazon. We generally only get our mail forwarded from South Dakota once a month at the most, so the most recent shipment contained both month old birthday cards for Tim and more recent ones for me. 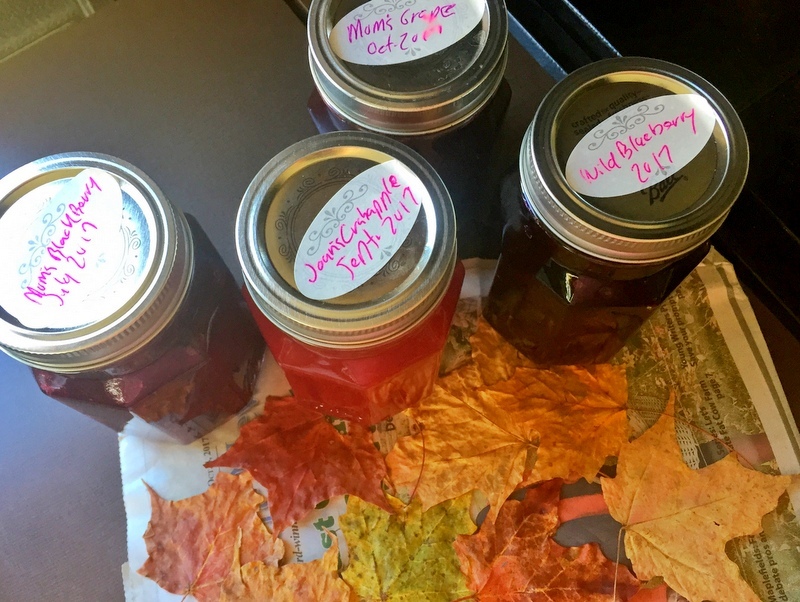 We also got a package from my dad containing a new supply of homemade jams (Wild Blueberry, Mom’s Blackberry, Mom’s Grape & Joan’s Crabapple) plus a few Vermont falls leaves thrown in for fun. 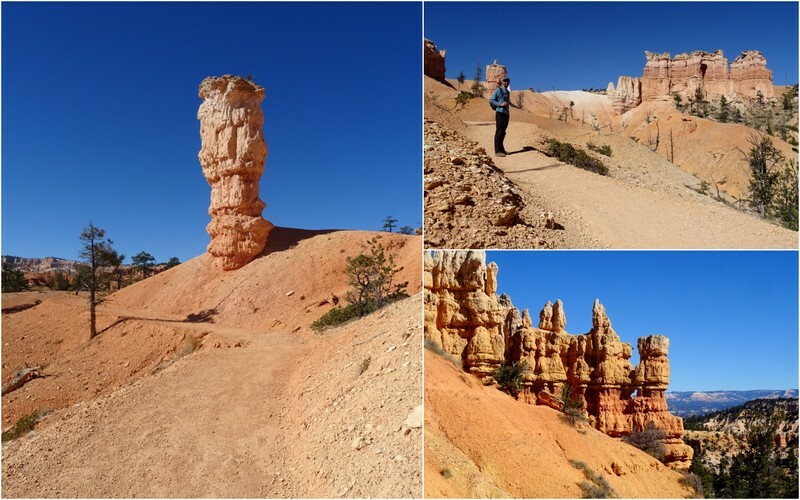 After a quick stop at the Red Canyon visitor center, we decided to hike the Golden Wall Trail with a side trip around the Castle Bridge Loop. It was a good plan except we took the turn for the Castle Bridge a little early, looped around and then decided to skip hiking all the way to the Golden Wall. Mosty because I didn’t feel like putting in the effort. I mean, if you can’t be lazy on your birthday, when can you? Since the last thing I wanted on my birthday was a crappy, overpriced restaurant meal, I requested that Tim make me a special dinner. I told him I wanted a “fancy” grilled cheese sandwich and a salad. Becuase really…is there anything better than melted cheese and bread??? 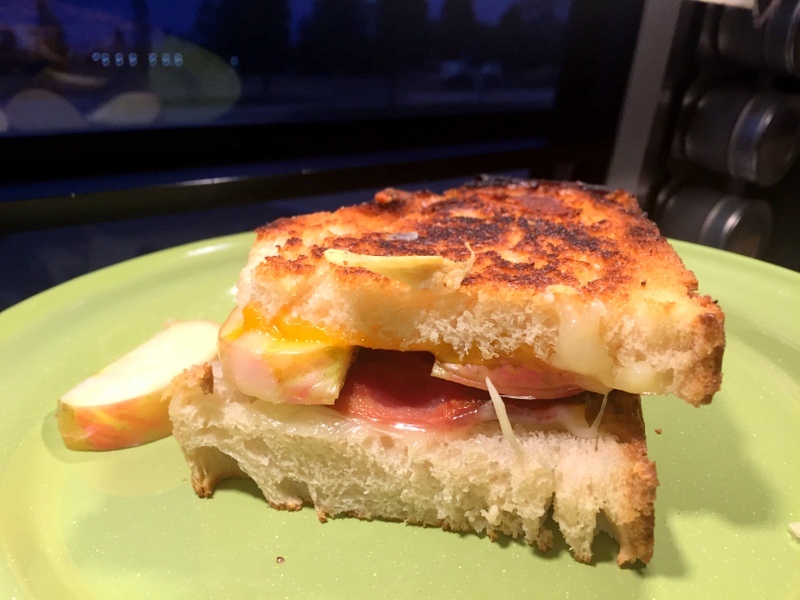 What I got was two slices of homemade sourdough with Havarti cheese, thick smoked bacon, and a layer of crisp apple. Better than any restaurant! I didn’t go outside once today. It was cold and cloudy and I decided there was no reason to leave my cozy home. Instead, I put the ingredients for 15 Bean Soup with Ham in the crockpot and settled in for a long day of working on the computer and completing some other household tasks. It might not have been the most exciting day, but it felt just right. Overnight, the sky cleared and we had another really cold night. It was only in the low 20s when I woke up. We forgot to discount the hose last night and of course, it was frozen. Fortunately, we still had some water in the tank, but we might have done some damage to our fresh water hose. This is why sometimes it’s easier to boondock during cold temperatures — no hoses to worry about. We waited a few hours to go out for our hike, but it was still only 32 when we hit the trail around 10:30. Today’s adventure was the Fairyland Trail. This was the one we missed out on last time because of bad weather and we were determined not to let the cold stop us this time. Despite the persistent cold wind that kept us bundled up, we loved this trail. 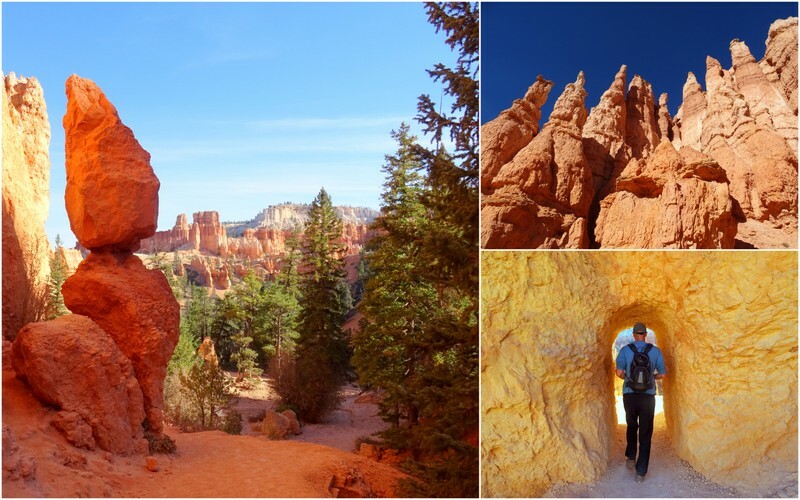 Bryce Canyon is undoubtedly gorgeous from the rim, but once you get down in there it’s like hiking through a magical world of colors and textures. For the first two miles, we only saw one other pair of hikers and thought me might have the entire trail to ourselves. Soon we caught up with another group and then started passing lots of people hiking in the other direction. You can hike the loop going either way and it appears that we picked the less popular direction. Still, it was way less crowded than the Queen’s Garden & Navajo trails that we hiked the other day. I think the distance of this trail scares some people off. But the reality is that the long length makes that the hike both down into and up out of the canyon much more gradual and easier than the shorter trails. The cold air kept us moving briskly and by early afternoon we had completed the loop. 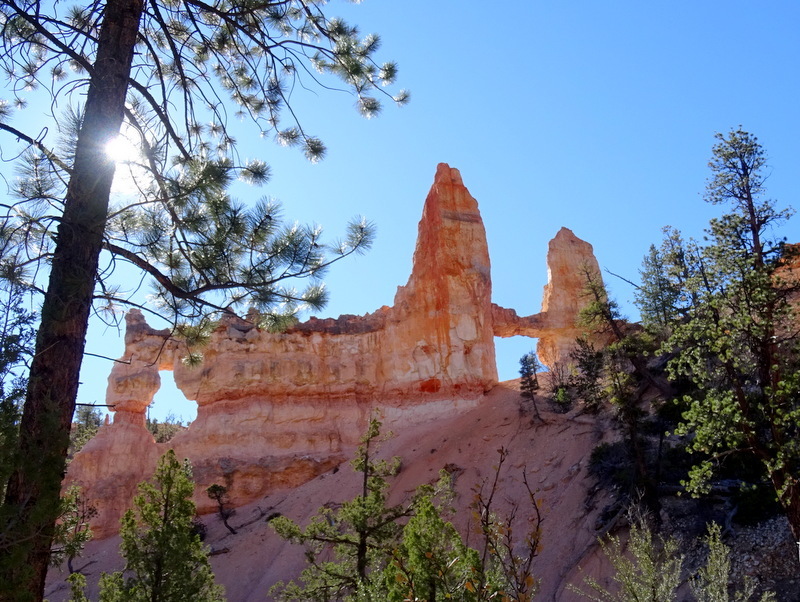 What a great way to end our stay at the always enchanting Bryce Canyon. Spoken like somebody from Vermont. I’m with you, when we leave headed south soon, we will be bringing a litre or two of maple syrup. BTW – 40 was a big one for me too (many years ago). Storing maple syrup in the RV is well worth carrying around the extra weight in my opinion! Happy birthday! The sandwich looks great. I see time as the only real currency I have to spend. The more years I get, the luckier I am. Too many of my friends didn’t make it this long. Great photos. That’s a good outlook on aging. I try to remember to cherish every year. That Red Breaks hike was an awesome way to start your 40’s! You go grrrrrl! 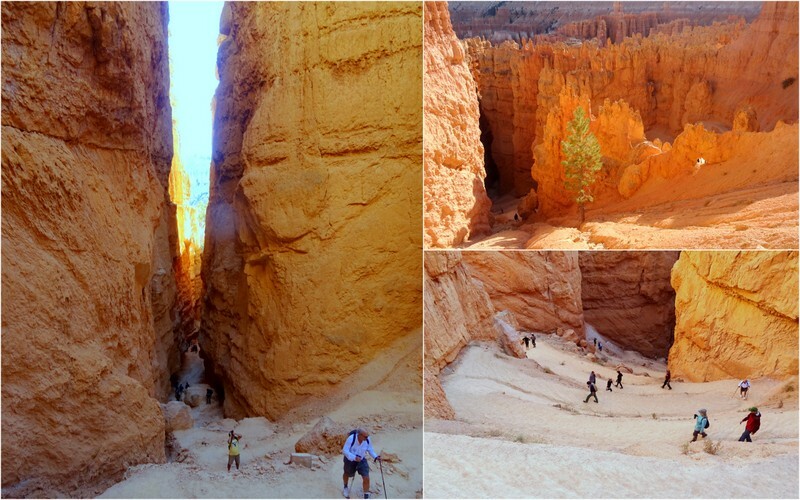 I’ve never hiked down into Bryce, seems like something I need to do someday. Thanks for the virtual trip into the canyon. Yup, that hike fit the bill for ushering in my 40s with something truly spectacular. 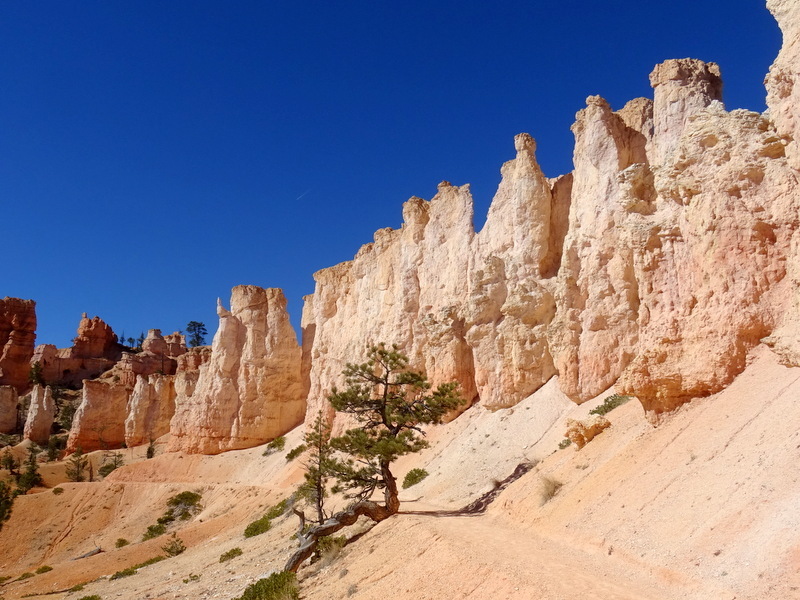 Hiking down into Bryce Canyon is definitely something you need to do. It’s so much different than looking down from the rim! Happy Birthday Amanda! 50 yrs huh? That would make us almost the same age. I’m with you regarding the real maple syrup! Maybe, because my father was from Vermont. I really enjoy seeing your photos and reading about your adventures. I might never feel comfortable doing the hiking you two do, but I love those views. Belated Happy Birthday to each of you. Happy Travels. Sounds like your father did a good job of instilling his love of maple syrup on you. Any true Vermonter would have it no other way! Thanks so much for the birthday wishes and for following along on our journey. Ha, I just left a comment on your Red Breaks post about ya’ll being badass and younger than us, and then I read this post about the hike being badass and how you’re younger (than us). I think the hard part for me about turning 40 was knowing that from then on, younger people were going to view me as old. Now that I’m 61, I feel that way more than ever. I don’t look old, I don’t think old, I don’t act old, and most importantly I don’t feel old, so I resent being thought of as old. Anyway, happy birthday! The best time of life is ahead of you, truly.